Including a calendar link in your email campaigns can receive a substantial boost in conversion rates. What we're doing here is appending the email address of the prospect to the Chili Piper link via a contact merge field. 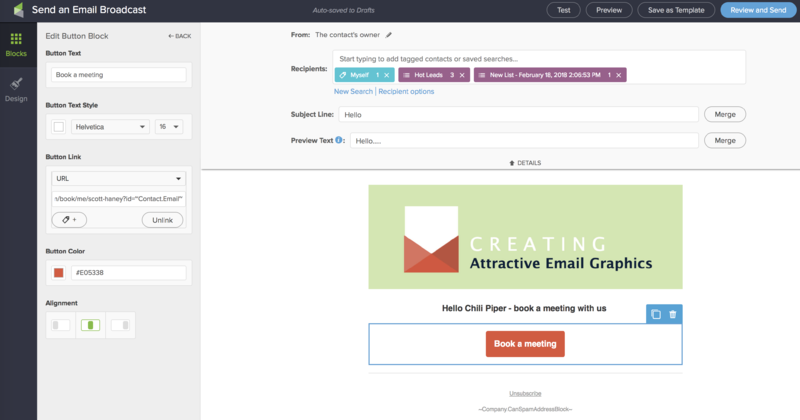 The contact merge field for an email address is indicated by ~Contact.Email~ and this allows the prospect to book a meeting in 1-click, no form fill required. Once example@domain.com gets the email, he/she magically books a meeting with Scott in 1-click and receives calendar invite. No form was filled, Scott receives notification that a meeting was booked, and all the details logged directly into Salesforce. Note: Smart Booking Links work with individual calendar URL's & Queue URL's . If your Queue uses the "Prioritize Based on Ownership" algorithm, then you're able to utilize 1 URL for all your InfusionSoft emails, which route the meeting to the respective Salesforce lead/contact/account owner using the Salesforce ownership rules you define.